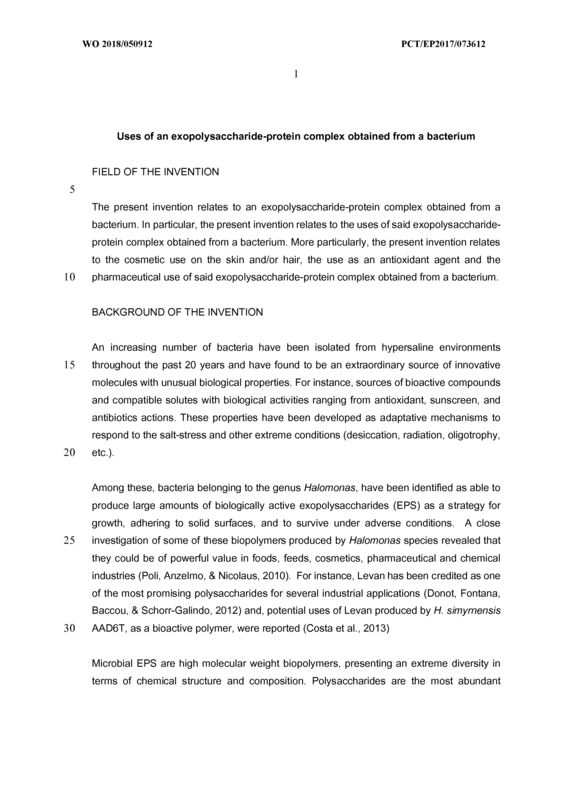 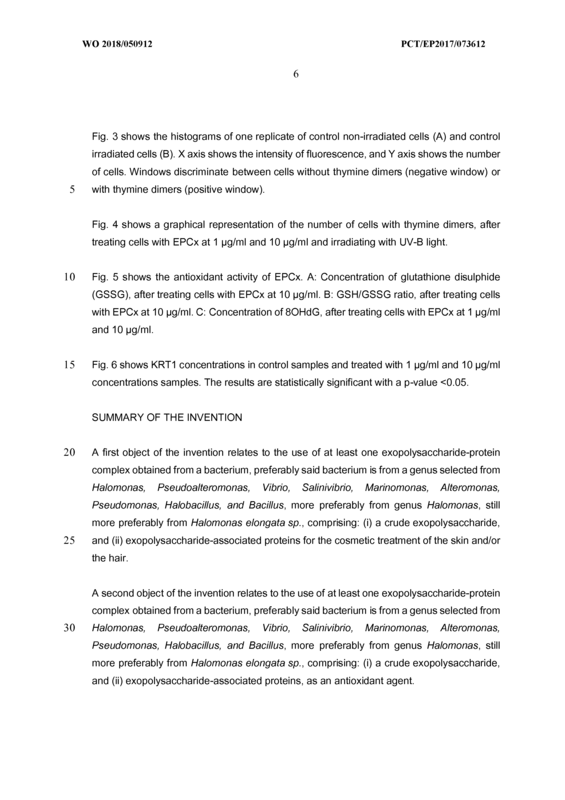 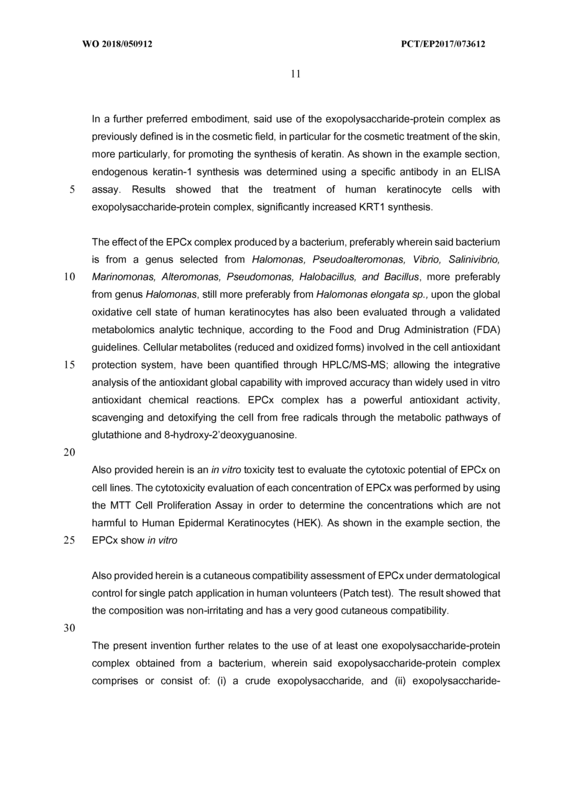 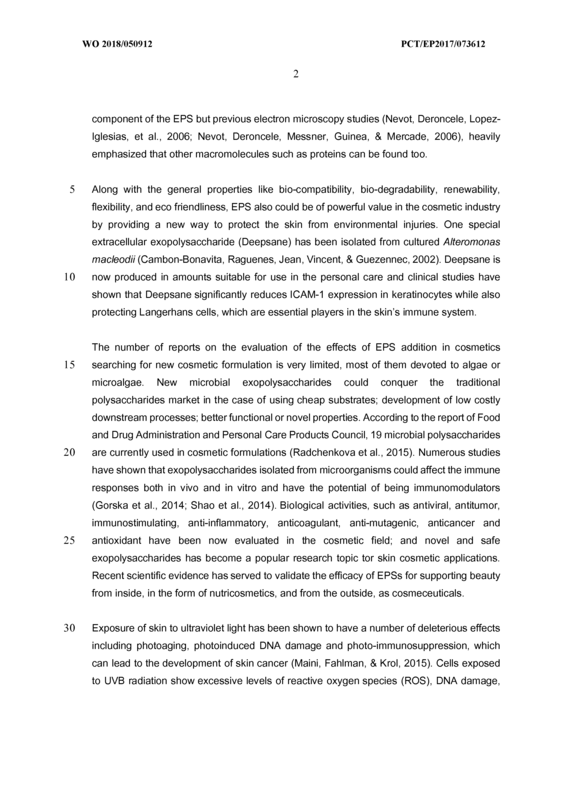 The present invention relates to the use of at least one exopolysaccharide-protein complex obtained from a bacterium, wherein said exopolysaccharide-protein complex comprises: (i) a crude exopolysaccharide, and (ii) exopolysaccharide-associated proteins for the cosmetic treatment of the skin and/or hair, as antioxidant agent or for use in preventing or treating an oxidative stress-related disease ora disease selected from skin cancer, psoriasis, skin fibrosis, atopic dermatitis and atopic eczema, wherein the crude exopolysaccharide comprises: 30 to 60 wt% glucose, 30 to 50 wt% galactose, 5 to 10 wt % uronic acids and 1 to 10 wt% of other sugar units, providing that the sum of the components in the crude exopolysaccharide is 100 wt%, and wherein said bacterium is from Halomonas elongata sp. 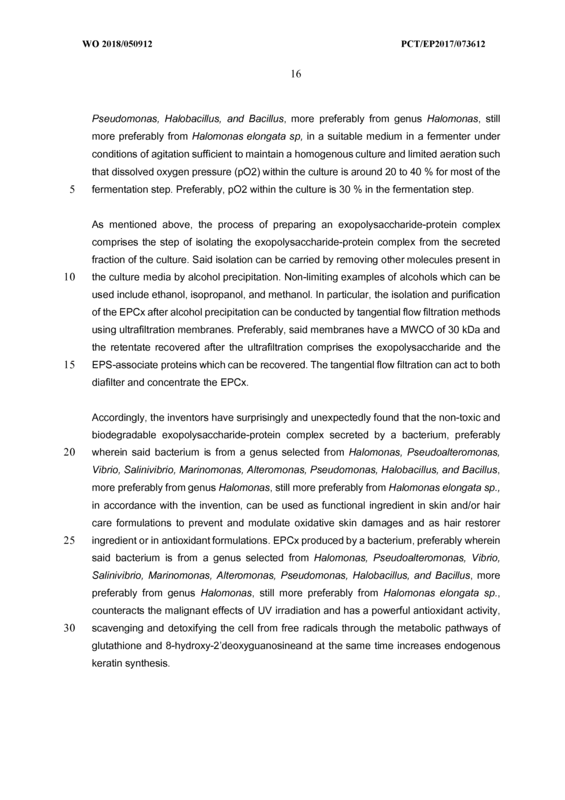 and wherein said bacterium is from Halomonas elongata sp. 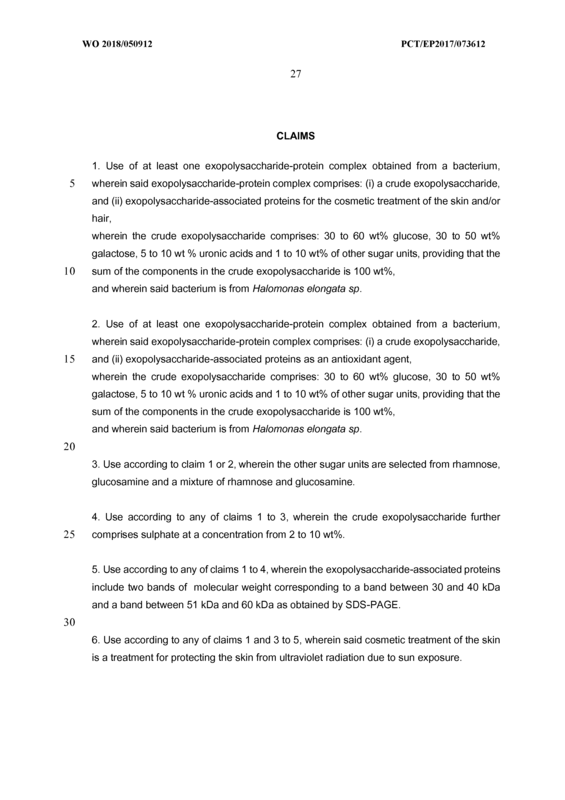 Use according to claim 1 or 2, wherein the other sugar units are selected from rhamnose, glucosamine and a mixture of rhamnose and glucosamine. 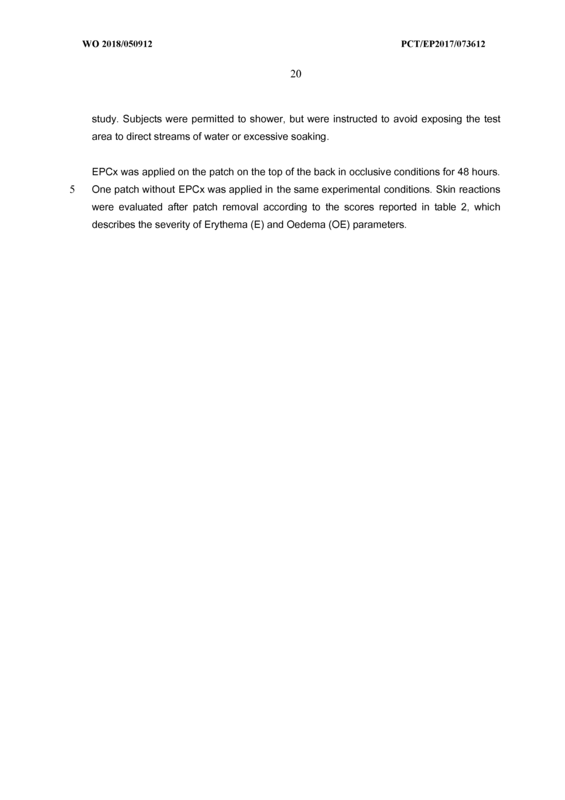 Use according to any of claims 1 to 3, wherein the crude exopolysaccharide further comprises sulphate at a concentration from 2 to 10 wt%. 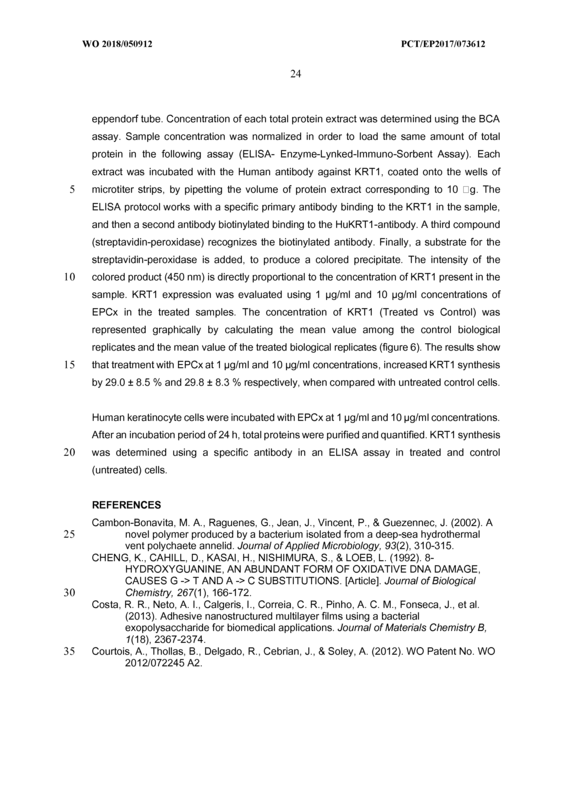 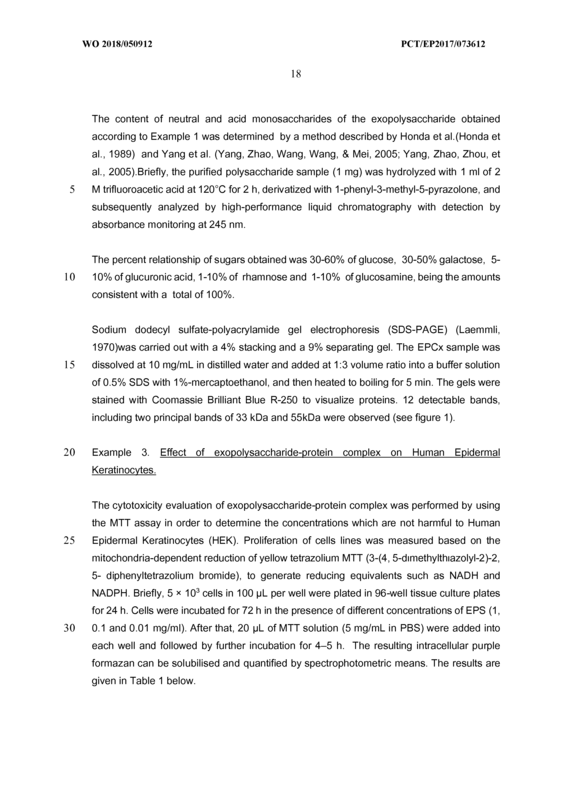 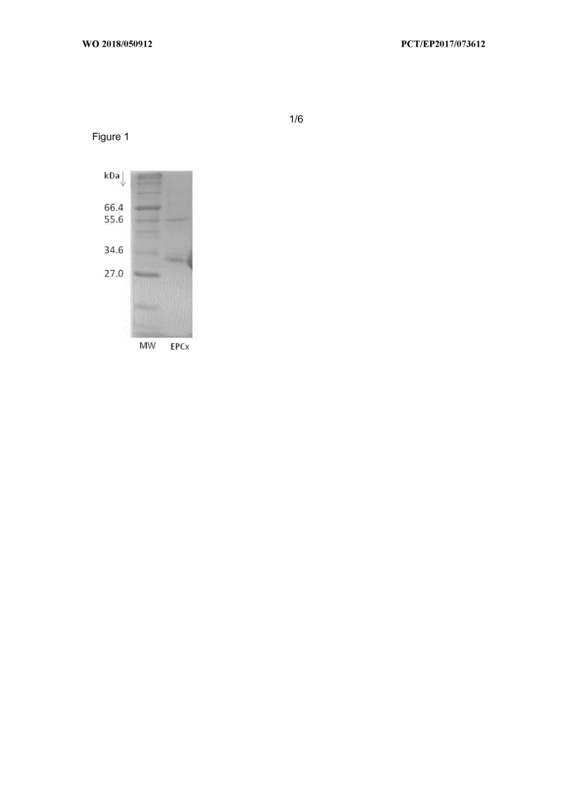 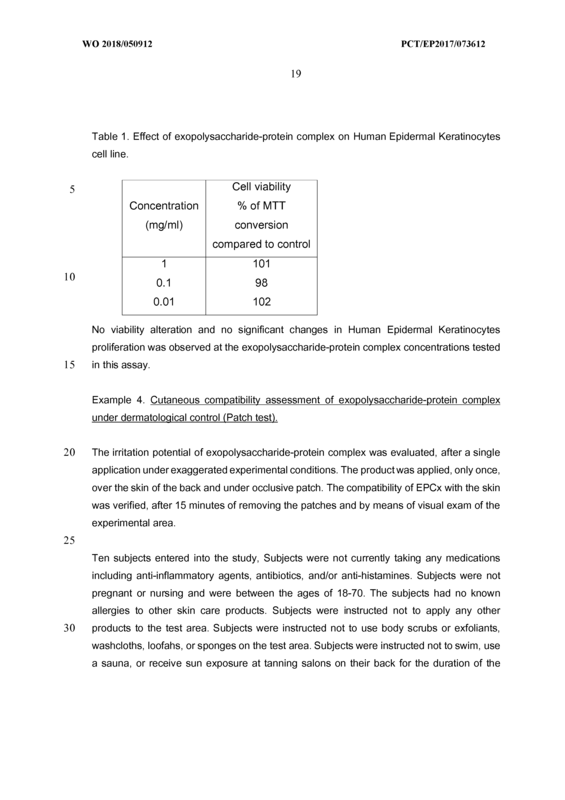 Use according to any of claims 1 to 4, wherein the exopolysaccharide-associated proteins include two bands of molecular weight corresponding to a band between 30 and 40 kDa and a band between 51 kDa and 60 kDa as obtained by SDS-PAGE. 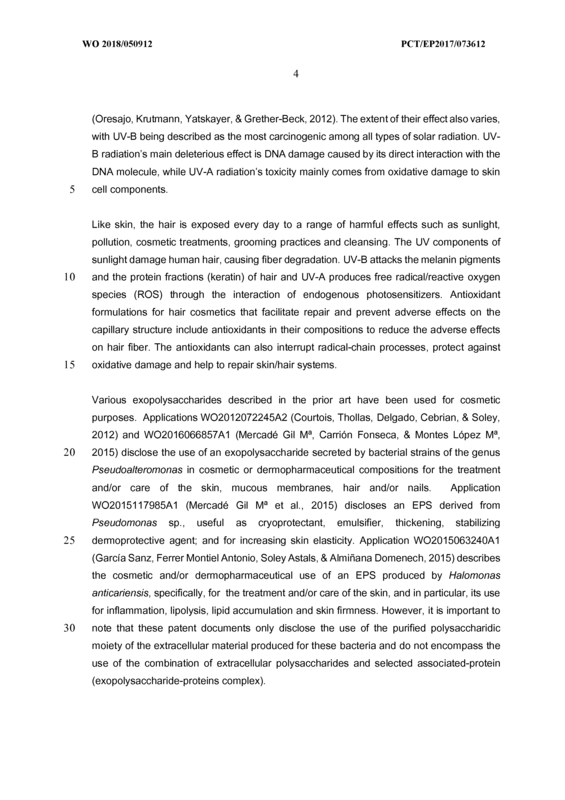 Use according to any of claims 1 and 3 to 5, wherein said cosmetic treatment of the hair is for promoting the synthesis of keratin. 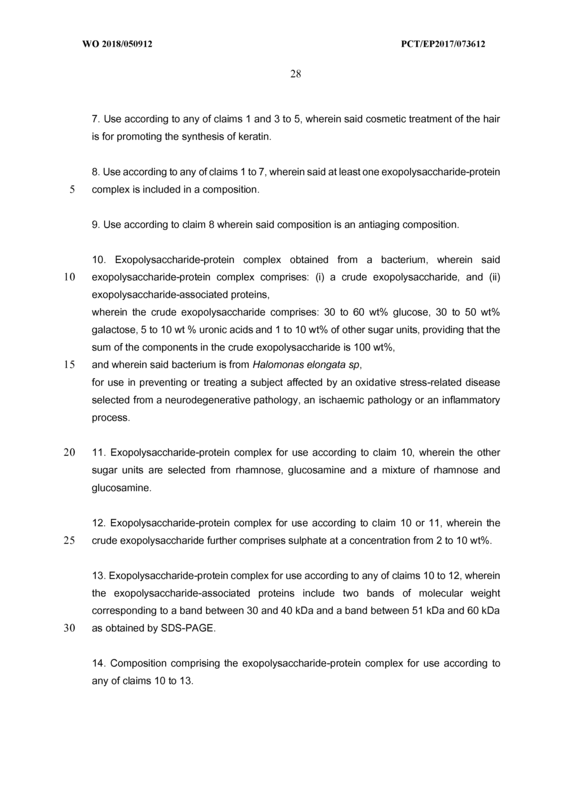 Use according to any of claims 1 to 7, wherein said at least one exopolysaccharide-protein complex is included in a composition. 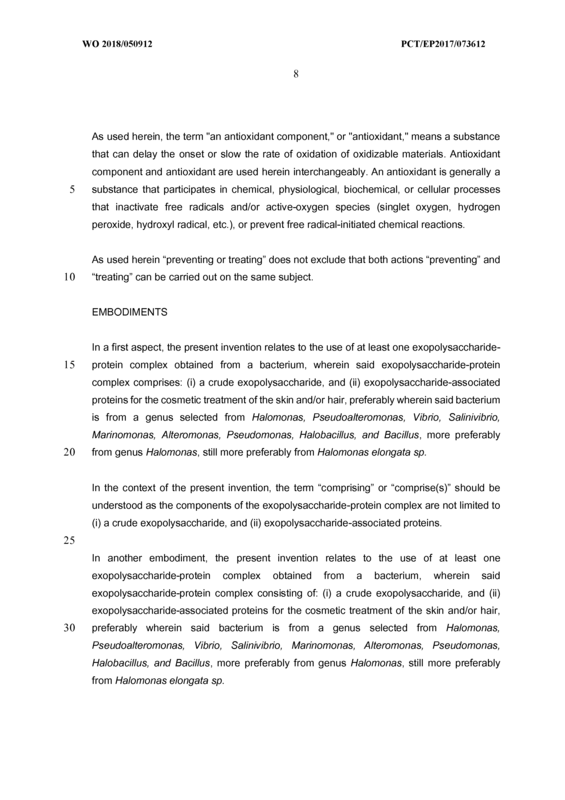 Use according to claim 8 wherein said composition is an antiaging composition. 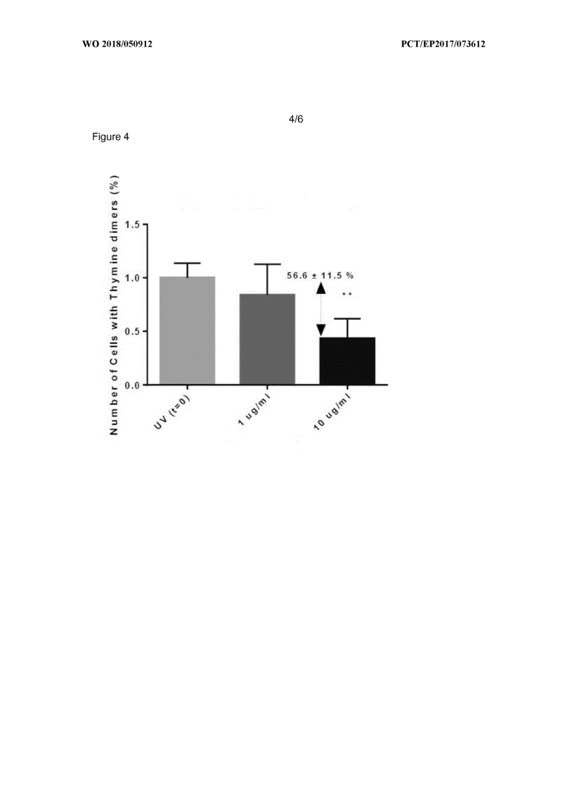 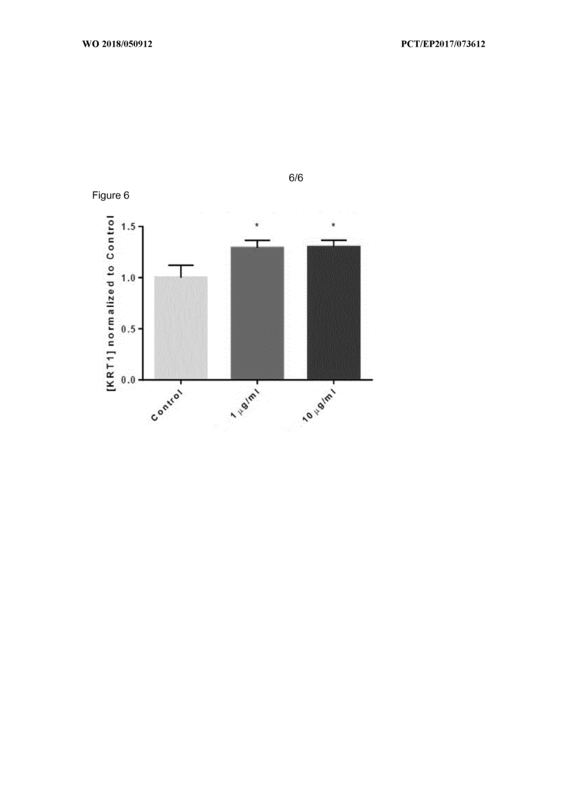 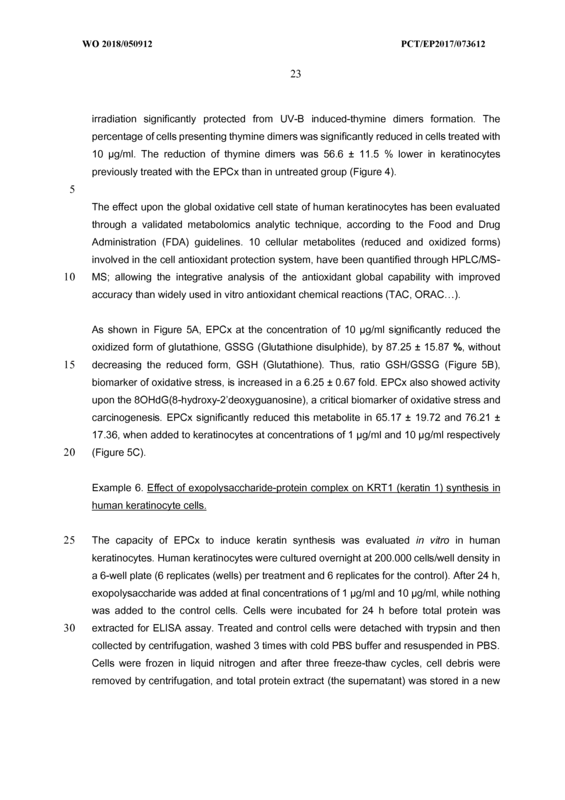 for use in preventing or treating a subject affected by an oxidative stress-related disease selected from a neurodegenerative pathology, an ischaemic pathology or an inflammatory process. 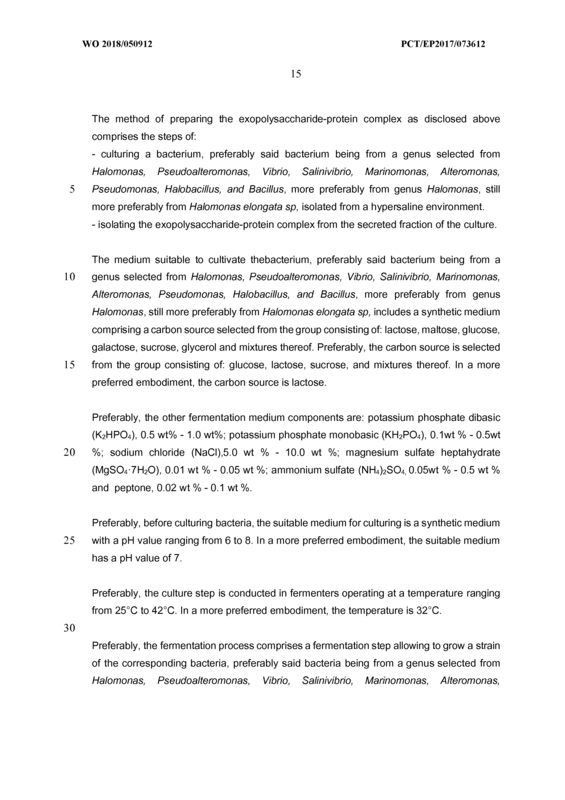 1 1 . 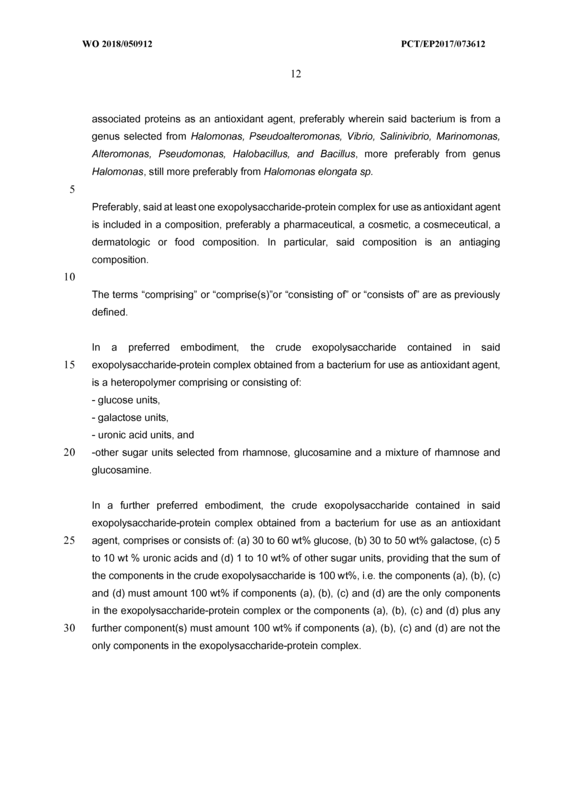 Exopolysaccharide-protein complex for use according to claim 10, wherein the other sugar units are selected from rhamnose, glucosamine and a mixture of rhamnose and glucosamine. 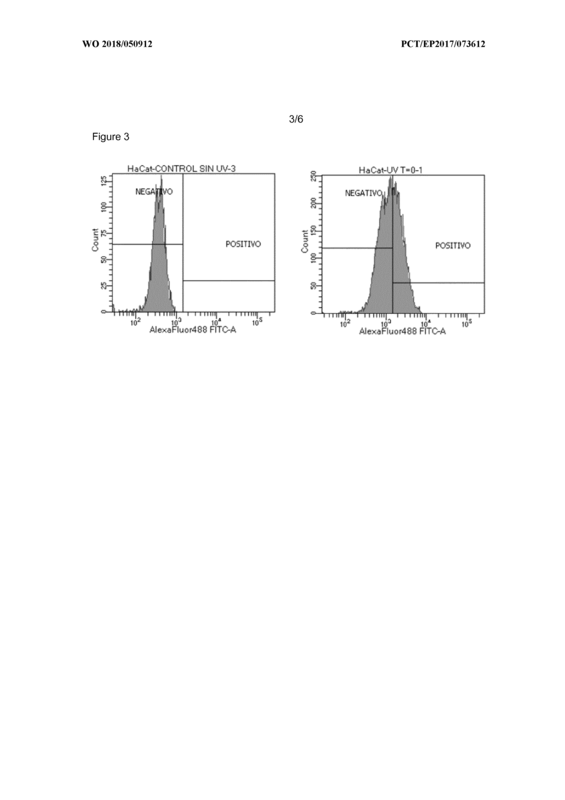 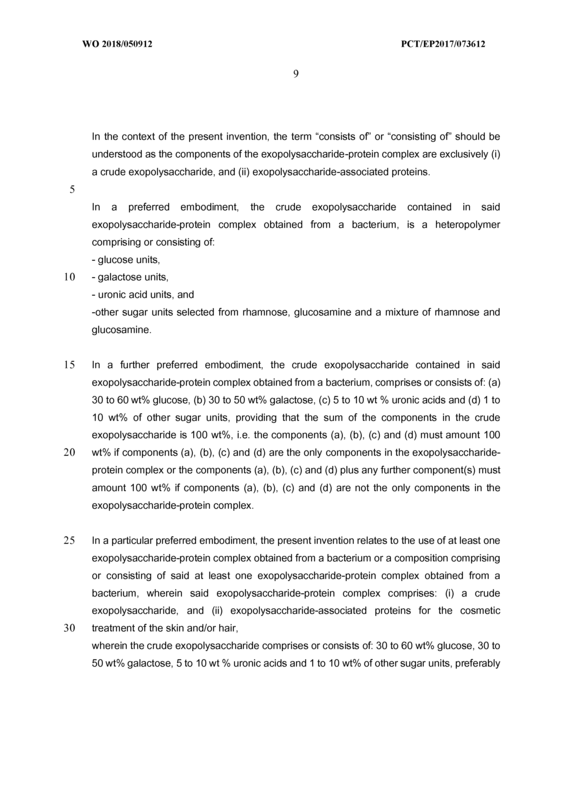 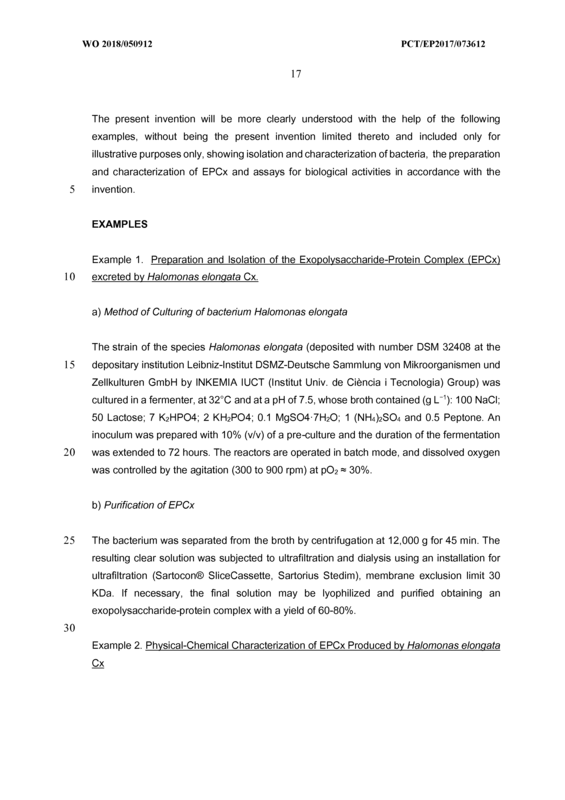 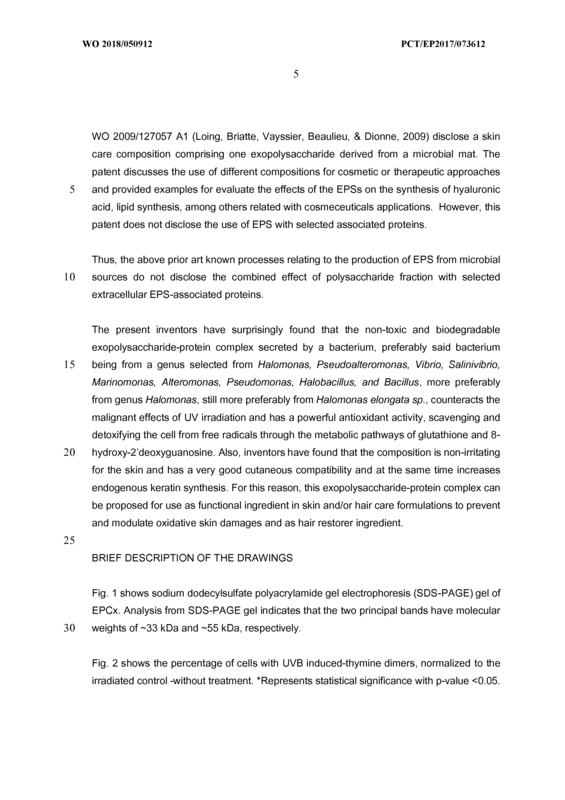 Exopolysaccharide-protein complex for use according to claim 10 or 1 1 , wherein the crude exopolysaccharide further comprises sulphate at a concentration from 2 to 10 wt%. 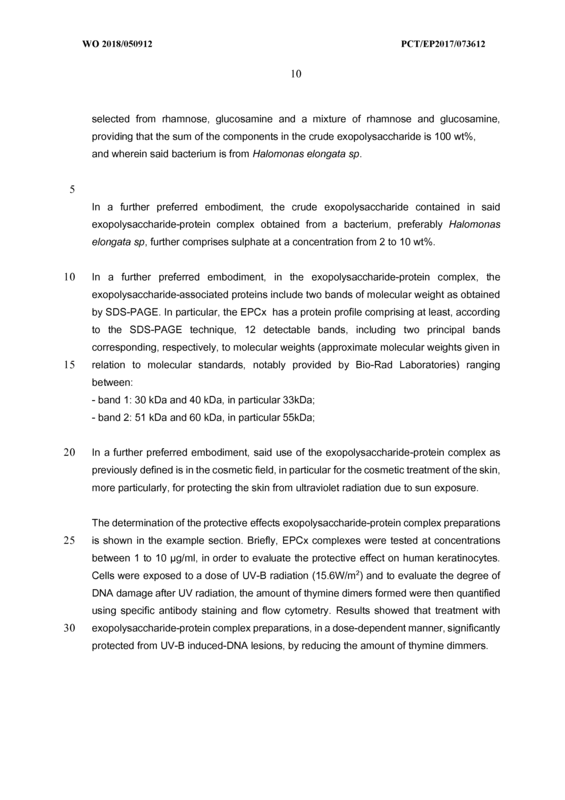 Exopolysaccharide-protein complex for use according to any of claims 10 to 12, wherein the exopolysaccharide-associated proteins include two bands of molecular weight corresponding to a band between 30 and 40 kDa and a band between 51 kDa and 60 kDa as obtained by SDS-PAGE. 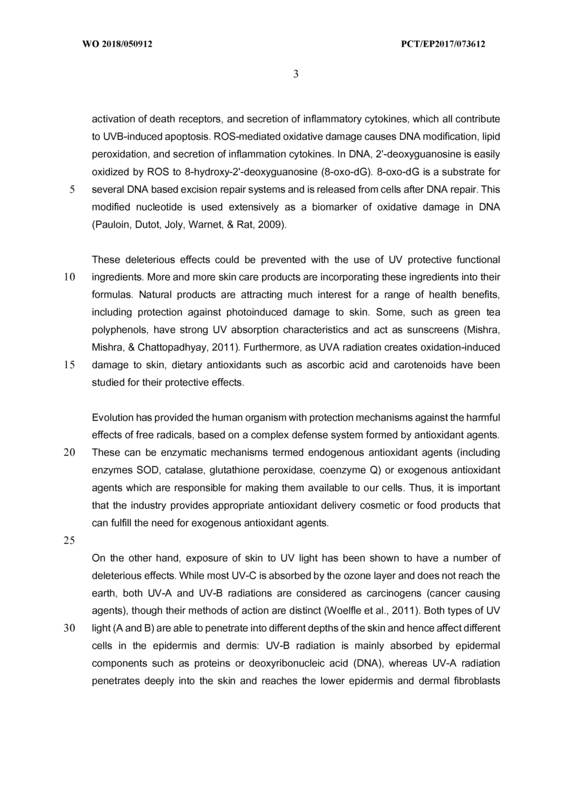 for use in preventing or treating a subject affected by a disease selected from skin cancer, psoriasis, skin fibrosis, atopic dermatitis and atopic eczema. 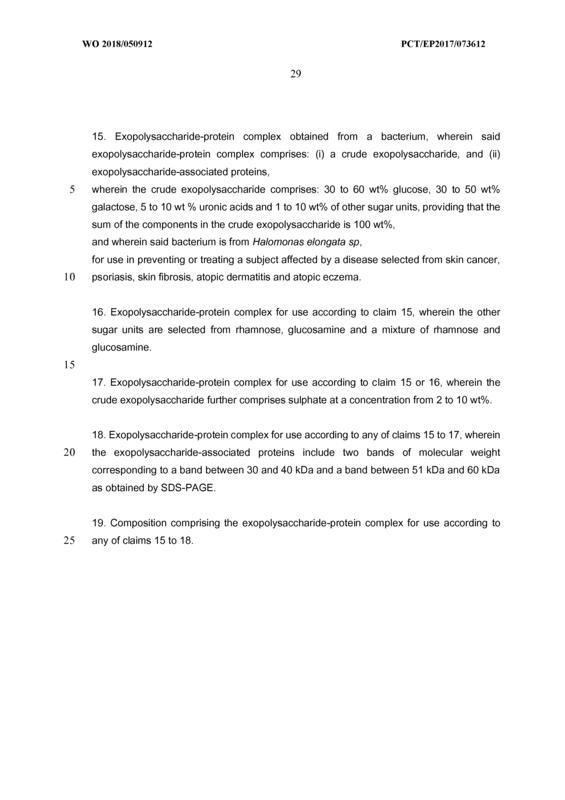 Exopolysaccharide-protein complex for use according to claim 15, wherein the other sugar units are selected from rhamnose, glucosamine and a mixture of rhamnose and glucosamine. 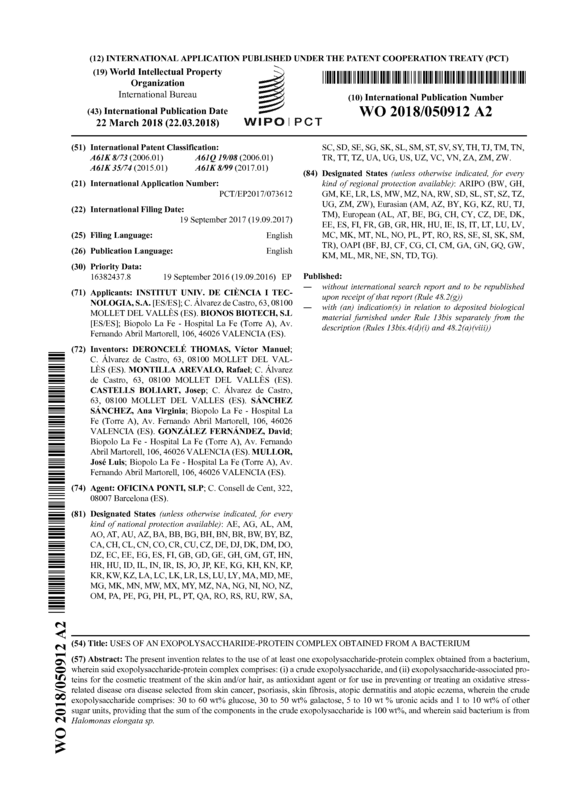 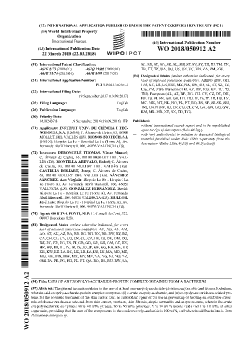 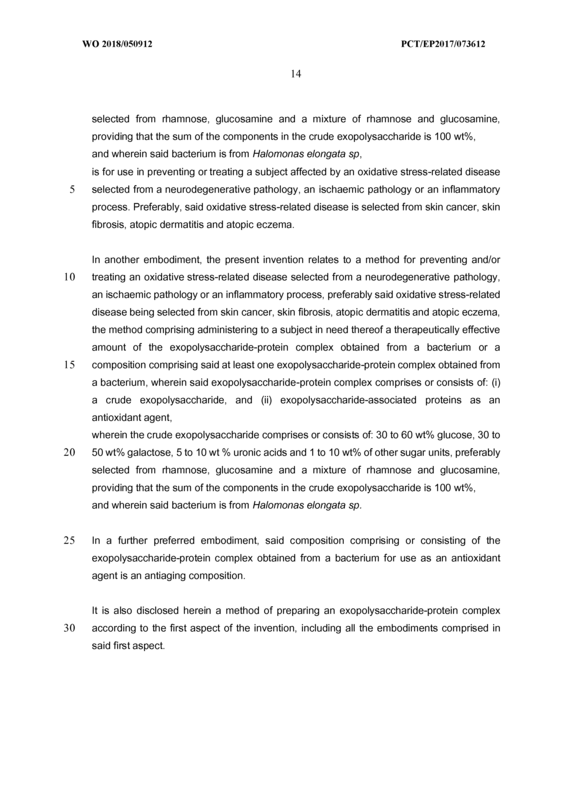 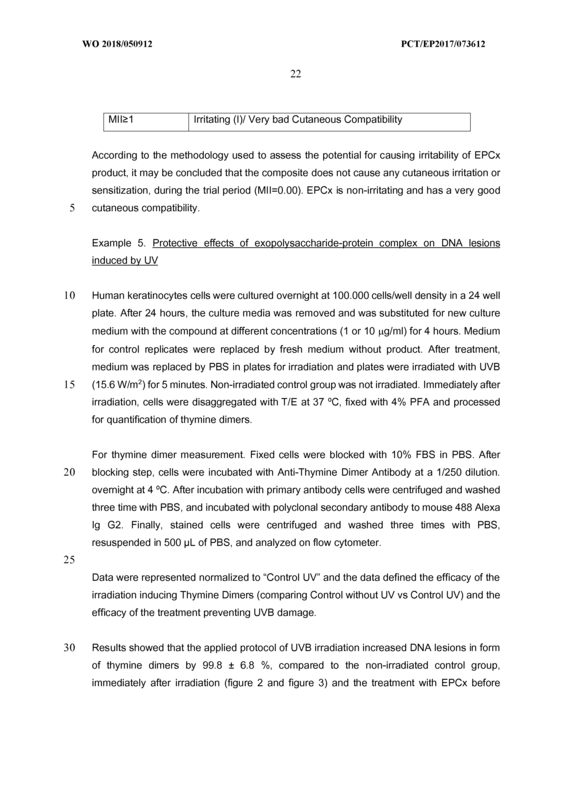 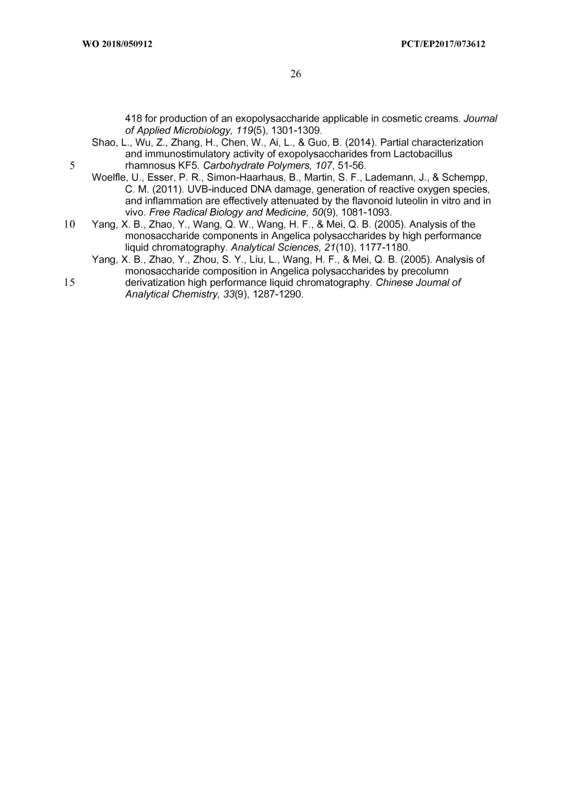 Exopolysaccharide-protein complex for use according to claim 15 or 16, wherein the crude exopolysaccharide further comprises sulphate at a concentration from 2 to 10 wt%. 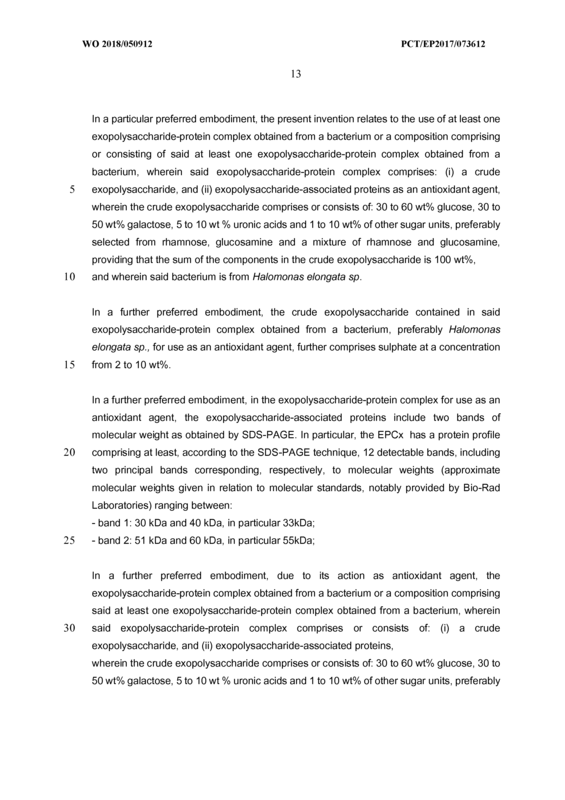 Exopolysaccharide-protein complex for use according to any of claims 15 to 17, wherein the exopolysaccharide-associated proteins include two bands of molecular weight corresponding to a band between 30 and 40 kDa and a band between 51 kDa and 60 kDa as obtained by SDS-PAGE. 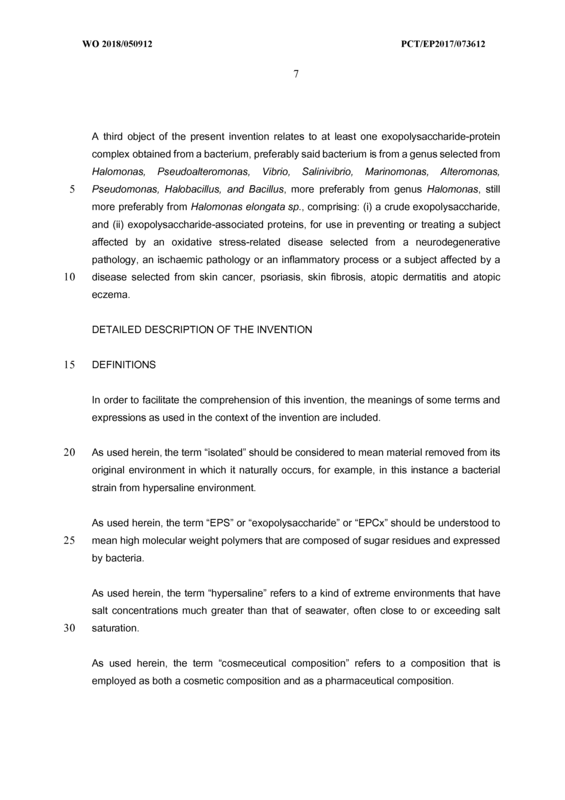 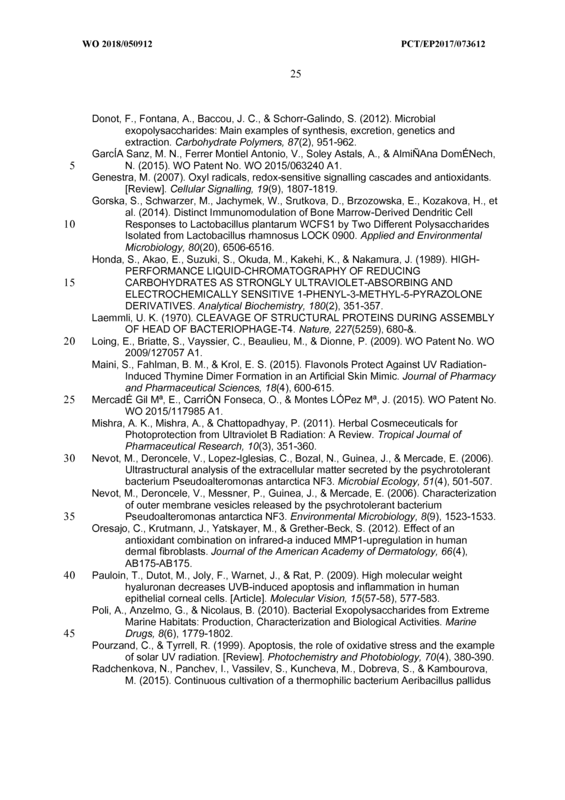 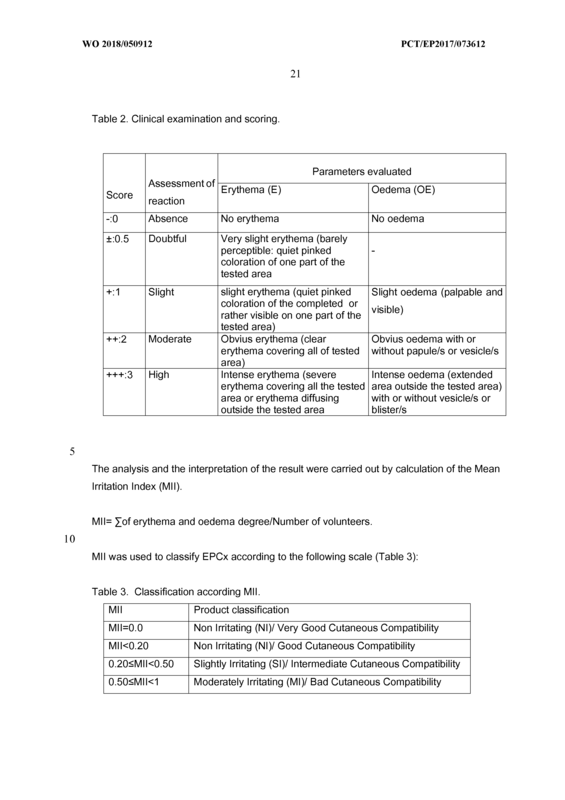 Composition comprising the exopolysaccharide-protein complex for use according to any of claims 15 to 18.